The Hyundai Equus is one of my favorite cars available in the US today and there are very few things that I could suggest changing. 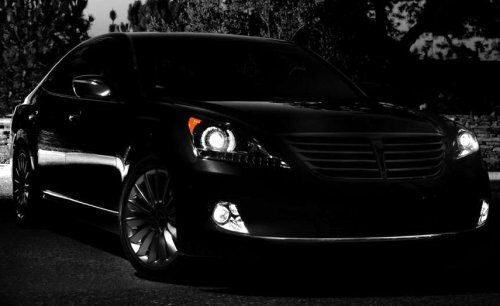 However, this shadowy teaser of the 2014 Equus reveals at least one change that will add to the aesthetic appeal of the incredible range topping luxury sedan. This change comes in the form of the wheels, which clearly have a very different design than the big chrome rollers found on the current Equus. While those wheels are fitting of a high end luxury sedan, they really don’t match the sporty feel displayed by the Equus or the rest of the Hyundai lineup. From what we can see of the new wheels in this first teaser of the 2014 Equus, they appear to have an angled blade design that looks far sportier than the rounded 9-spoke rims on the current model. Beyond the new wheels, the changes coming to the 2014 Hyundai Equus are hard to pick out in this shadowy teaser image but the company has promised new and enhanced features. Among these items are exterior and interior design elements, interior material quality, alterations to the ride, handle and vehicle control dynamics, advanced safety features and driver technology displays. Based on this sold teaser image of the new Equus, the exterior changes could be limited to the wheels although we cannot see any part of the front fascia shy of the fog lights so perhaps there will be some different sculpting along the nose of the big luxury sedan. In terms of interior design and material quality, this is an interesting area as the Hyundai Equus is just so gorgeous inside. It has everything and everything is clad in plush leather so I’m not sure what they could add or what materials will be improved upon. The promise of improved vehicle dynamics and handling capabilities for the 2014 Hyundai Equus is especially exciting because for a full sized luxury sedan, the Equus is a blast to drive. Much of that fun is due to the 429 horsepower V8 engine but in terms of cornering and braking the brawny Hyundai does well for its size. Finally, the addition of new driver technology displays will likely come in the way of customizable information displays in the gauge cluster, the navigation system, or both. Even though the range topping Hyundai Equus accounts for a very small portion of the Korean automaker’s US sales, the Equus is an important vehicles because it shows what Hyundai is capable of when they go all out. Hyundai is best known for affordable, efficient vehicles with a sporty exterior design with models like the Sonata, Elantra and Veloster but the Equus shows that they are far more than just another fuel friendly economy brand with vehicles like the Veloster Turbo, the Genesis coupe, the Genesis sedan and the awesome Equus. One of the reasons that automakers have luxury brands is to cater to those buyers who started out in affordable models and gained confidence in the brand in doing so. When the time comes for some of those people who bought a Sonata to buy a high end luxury sedan, rather than turning to BMW or Lexus, they can go to the same company who provided their current car. If a Camry buyer wants a luxury car, they may look to the Lexus brand. If a Taurus owner wants a luxury car, they may look to the Lincoln brand. If a Sonata owner wants to buy a luxury car, he or she can go to the same dealership that sold and serviced their current car – meaning that they can expect the same quality dealership experience with their new Equus. The 2014 Hyundai Equus will make its formal debut at the 2013 New York International Auto Show in Javits Center on March 27th, 2013. For comparison, we have included a gallery of our 2012 Hyundai Equus Signature test vehicle and you can check that out by clicking any thumbnail on this page.